When I was researching the Hindmarsh Family I kept coming up against the name Frank Bengough Jones and at first it was very confusing, however eventually I worked out that there were 3 different men called this name. Firstly there was Francis Bengough Jones who married Frances Hindmarsh in Australia, then there was his son Frank Bengough Jones, the third one was the son of the brother, James, of Francis Bengough Jones snr. Death:	14 Oct 1895 in Prahan Alfred Hospital, reg no 14796 Australia; Acute Pneumonia	lasting 2 weeks. I do not have a great deal of information regarding this family except for some rather interesting Court papers. On 6th May 1865 David Powell filed a Bill of Complaint in Chancery. These Court papers are very useful as they confirm the various family members. The action is taken by "..David Powell of Penlangrick in the Parish of Llandewiyrcwm in the County of Bracon, Farmer..."
"1. Thomas Williams late of Cwmmole in the Parish of Llanbadarn-y-garreg in the County of Radnor farmer deceased the testator hereinafter named...."
and appointed the Plaintiff David Powell to be the sole executor of his said will and testament and gave him the sum of £20 free from all deductions for acting ...."
"3. The said Thomas Williams died on the 1st day of November 1863 ......"
The complaint goes on to say that the testators personal effects raised £491 and that all of this and more was required to pay the testators debts and expenses with an amount of £180 outstanding plus his own £20 remains unpaid plus another £20 of expenses incurred by him, David Powell. The Plaintiff David Powell then goes on to list Thomas Jones 10 children and states that James, May, Matthew and Elizabeth are under the age of 21. He then says that on Thomas William's death, Thomas Jones (Frank Bengough Jones' father) took possession of the estate in Llanbadarn-y-garreg and occupied and farmed it until shortly before his death on 7th March 1865. In February 1865 he let the farm to a William Prothero and now the said Wm Prothero is tenanted to the heirs of Thomas Jones. David Powell then goes on to say that all of the deeds bar one for a small part of the estate, are held by the Jones family and they will not release these to him. He says he has asked for the Jones family to pay the outstanding sum of £220 however has been refused and will not consent to a sale of the estate in order to pay the outstanding expenses incurred by him the executor. He says that the estate is only about 52 acres and alleges that the Jones family have been chopping down the woodland thereby diminishing the value of the estate. He asks for an order of the Court for sufficient of the estate to be sold to repay the expenses and he asks for an injunction preventing the family from lopping and felling any further trees. When Francis Bengough Jones died in 1883 in Australia, probate was later sought in 1885 in England by his wife Frances' attorney, her sister Isabella Hindmarsh, for over £15 of estate in England, so maybe this was his share of this estate. 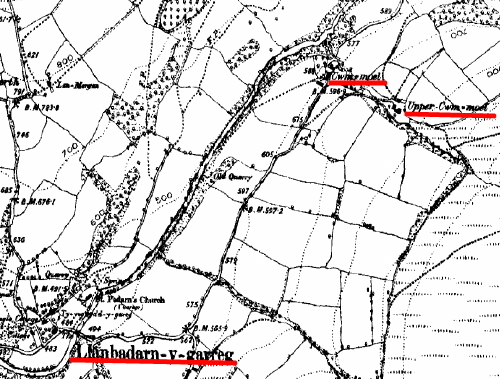 "LLANBADARN-Y-GARREG, a parish, in the union of Builth, hundred of Colwyn, county of Radnor, South Wales, 7 miles (E.S.E.) from Builth; containing 81 inhabitants. This parish comprises 628 acres of inclosed land, besides a great quantity of hilly ground not measured, and is situated on the small river Edwy, by which it is intersected, and of which the stream is here very narrow. The living is annexed to the rectory of Caregrina. The church, dedicated to St. Padarn, is an ancient structure, consisting of a nave and chancel, appropriately fitted up for divine service: it has no tower or steeple; a single bell is suspended under a small shed. There is a place of worship for dissenters, with a Sunday school held in it. 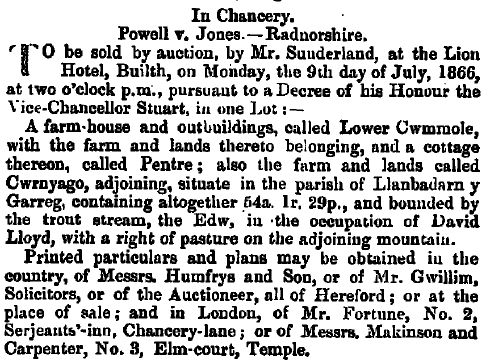 A rent-charge of £12 on a farm called Vron Oleu, in the parish, was bequeathed in 1633, by Lewis Lloyd, to be annually distributed among the poor of Aberedw, Llanvareth, and Llanbadarn-y-Garreg; and an unknown benefactor gave £10 in money, subsequently secured by a mortgage on a farm, and producing 10s per annum, for the relief of decayed housekeepers of this place." Search our website or contact Us.